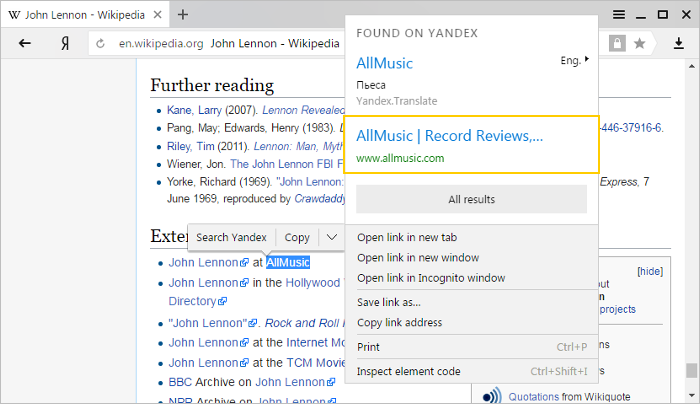 Yandex Browser offers suggestions to help you enter your search terms. And if you select any word or phrase on a website page, the browser shows an explanation (quick answer) for it right in the context menu. Search suggestions are popular searches with the same first letters as your query. The suggestions list appears beneath the search bar and changes as you type new letters in the search bar. When you see a suggestion that matches your query, you can select it by using the mouse or the Up or Down keys. To go to the search results, press Enter. You can make your query more specific by adding text to the selected suggestion. Yandex Browser provides answers to common questions in the search suggestion list. For example, you can find out the depth of Lake Baikal or the height of Mt. Everest without going to the search results. You can also enter a phone number you got a call from into the Smartbox. If this number has been used for advertising purposes and there has been enough online feedback about this number, you will see a warning in the suggestions. 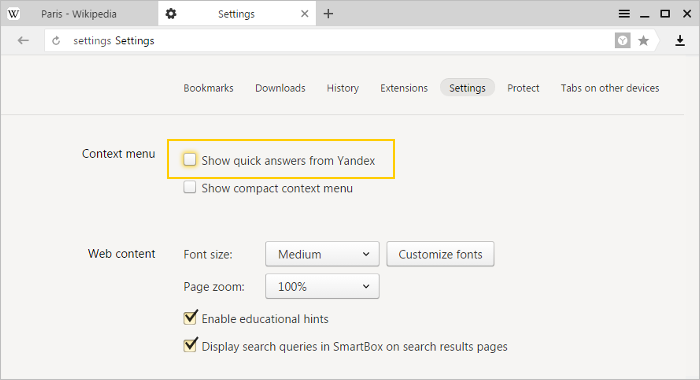 Quick answers is a way to get extra information from Yandex in the context menu on web pages. Select a word or phrase on any page where you want to get more information and click to the right of it. 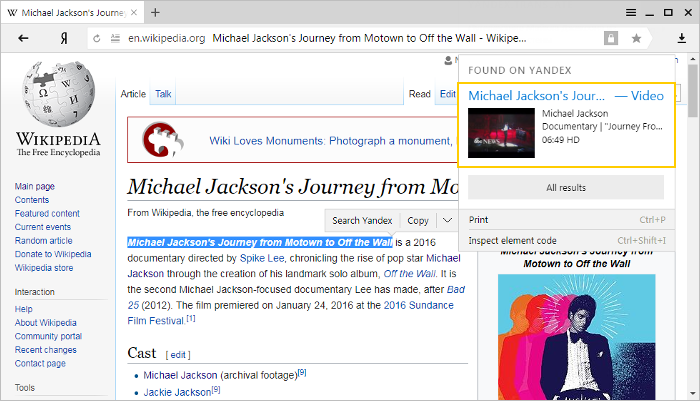 If you highlight a concept, the context menu contains a short explanation with a link to Wikipedia. 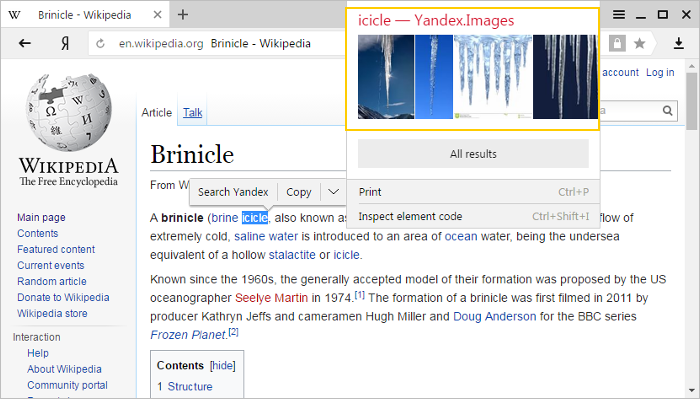 If Yandex.Images has pictures related to the highlighted word, the context menu contains links to the images. If Yandex.Video has a video related to the highlighted word, the context menu contains a link to the video. If you highlight the name of an organization or event that has its own site, the context menu contains a link to that site. 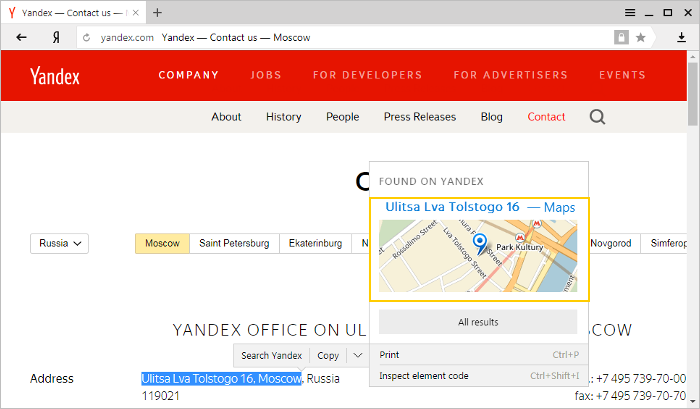 If you highlight an address or the name of a city or country, the context menu contains a link to the location on Yandex.Maps. 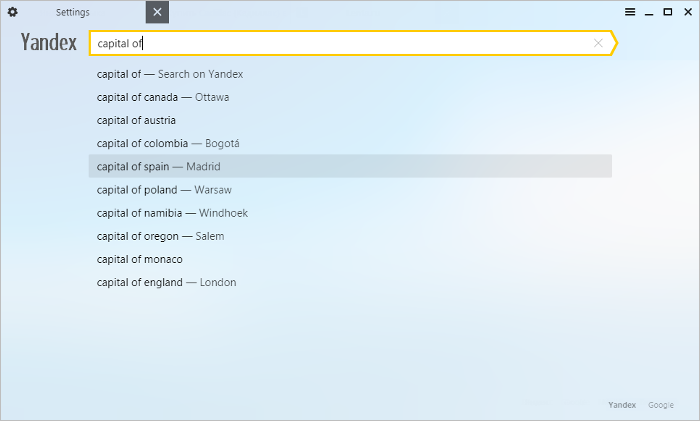 In the Context menu section, deselect the Show quick answers from Yandex option. To start searching a page, click → Advanced → Find or press Ctrl + F (on Windows) or ⌘ + F (on macOS). By default, search on page in Yandex Browser tries to find any grammatical forms of a given word on the page. For example, if you enter "teach" into the search bar, the browser will also show words such as “teaching”, “teacher”, etc. 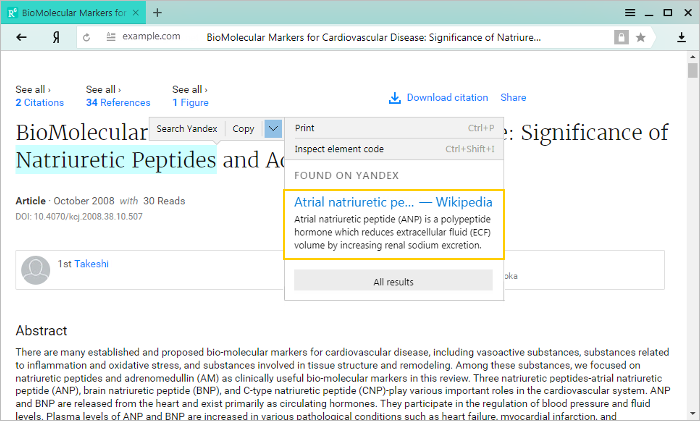 If you want to find specific grammar forms of a word without any related forms, select the Exact match option in the search window.